Unheard of pricing on our closeout magnet products. Great deals on production over runs and end of roll remnants. All magnet is new. Easy to cut it to your desired size. Hurry - Quantities are limited. 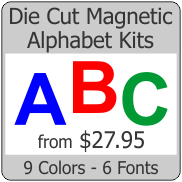 Over 250 pcs of plain magnet cut into round circles - Good Assortment of sizes from 1" to 4". Loo..
500 pieces of whited magnet 1-1/2" Circles. 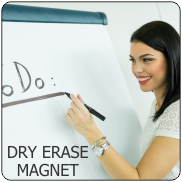 This is medium 030 magnet which is great for most c..
200 pieces of white dry erase rectangle magnetic labels. This is medium 030 magnet which i..
Save big on this left over magnet from another job. 36 inch long strips are roughly 7/8 inch wi..
We will pack a USPS Flat Rate box with about 40 square feet of various pieces of colored magnet - in..
125 pcs of thin plain Round Magnets. This is THIN .020" magnet which is great for lig..
120 pcs of Round White Magnet - Various sizes. This is various sizes ranging from 1 to 10 inche..
We will pack a USPS Flat Rate box packed full with about 15 square feet of various pieces of colored..
32 pcs of thin plain Round Magnets. This is plain magnet which is great for any project. ..
Peel n Stick sign vinyl for crafts, scrapbooking, signs, etc. Oracal brand series 651 graphics film ..